While her widowed mother sinks deeper into depression, the village leaders talk of moving the people to join a nearby community to share resources. Shida is excited. At last, she may have a chance to go to school, to become an educated healer, like the beautiful nurse who comes to her village sometimes. Everyone struggles to adjust to life in the new village. Many people do not like the idea of girls in school. Shida and her cousins find themselves the target of bullying from adults and students alike. To make matters worse, she is still expected to care for her mother’s crops and cook and clean in addition to her studies. 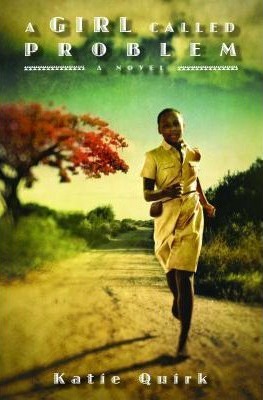 When crops suddenly fail and illness strikes a small child, the village is thrown into turmoil. Are the ancestors unhappy? Have they cursed the people for moving their village? If they return to their former home, Shida will lose the chance to attend school and help the nurse. In order to stay, she will have to convince everyone that there is another explanation for the terrible problems that seem to plague her people. Shida and her people are caught between tradition, which dictates that misfortunes are caused by curses from witches or angry ancestors. While Shida strives to be respectful toward the elders, she also seeks alternate rational answers for why bad things happen. Her mother and another widow are sometimes referred to as witches, though neither are. A boy pokes and hits the girls with a long stick during school and threatens them. No graphic details. Tagged A Girl Called Problem, Katie Quirk, Superstition, Tanzania. Bookmark the permalink.